Founded in 1996 by biochemist Rebecca Rose, In Clover creates science-based supplements designed to enable pets to live longer, healthier lives. From its inception through today, In Clover remains committed to integrity and transparency and promises to deliver only the best and most beneficial supplements to support the health and wellness of your animal companions. Based on trusted scientific evidence, In Clover formulations utilize clinically tested levels of active ingredients. All formulas are researched and manufactured in-house under strict quality control standards. Raw materials and finished products are tested to ensure purity, efficacy, safety and palatability. 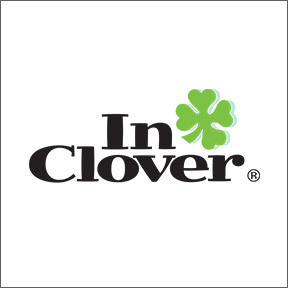 In Clover has earned the right to display the National Animal Supplement Council’s Quality seal on all their products. As a socially and environmentally responsible company, In Clover is powered by 100% wind energy, and all product packaging is recyclable and BPA-free. In Clover supports the health and wellbeing of all animals and donates regularly to reputable non-profit organizations dedicated to improving the lives of abused, homeless or abandoned animals. OptaGest® – Made without fillers, sugars or preservatives that could upset sensitive digestive systems, OptaGest® provides a gentle yet effective clinical strength formula, containing prebiotic organic inulin and four plant-based enzymes for daily support of normal digestion. OptaGest® supports intestinal balance and immune health with high levels of active ingredients that work with the body’s natural processes. OptaGest® is recommended for tummy upset caused by food changes, travel, stress, separation and the aging process. Suitable for dogs and cats. Also available in convenient travel packs. Feline 4 Pack – This daily wellness solution provides four scientifically formulated soft chews to address the most common feline health concerns. The kit contains a 40-day supply of Smile® to fight dental plaque and tartar; Sleek™ to address hairballs and support healthy skin and coat; Svelte™ for healthy muscle tone and fitness support; and Spry® for respiratory, ocular and immune health support. Daily use supports a healthy, vibrant kitty through all life stages. Grain, wheat, corn and soy free. No artificial colors, flavors or preservatives. Canine Combo Pack – This 45-day supply provides all you need to support your dog’s daily wellness in one convenient combo pack. Three soft chew formulations address common canine health concerns including Grin® for dental care and fresh breath; Glow® for nourishing and enhancing coat luster and shine; and Jump® for joint protection against the wear and tear of aging, exercise or daily activity. Grain, wheat, corn and soy free. No artificial colors or preservatives. Glow®, Jump® and Grin® available separately. Feline Connectin® Powder – To support stiff, aging bodies or to protect young, healthy joints, Connectin® has been clinically shown to improve comfort and mobility, while nourishing the joints and surrounding structures. Power packed, patented, powdered herbal formula with natural pork liver flavor. Canine Connectin® powder or soft chews also available. This entry was posted in Home and tagged Canine Combo Pack, Featured Brand - In Clover, Feline 4 Pack, Feline Connectin® Powder, OptaGest, Professional Supplement Center, Vitamins and supplements, www.professionalsupplementcenter.com. Bookmark the permalink.